While ambient music can be surprisingly loud, drone can be surprisingly soft; the genres dance around each other like yin and yang, never separating yet never quite reconciling. In each genre, the sharpest contrast makes the biggest impact. Drone can be clean or dirty, terrifying or transcendent, with its only constant the elongated tone. Sometimes it seems to have been made in a factory or lab. The genre seeks to tame sounds we experience without focusing upon them ~ from a refrigerator hum to a power drill ~ and turns them into music. And now A Closer Listen presents the Top Ten Drone Albums of 2016! 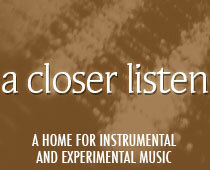 Pingback: ZOLFO featured in A Closer Listen TOP TEN Drone Albums | av-k prod.